Facebook shared some interesting news about its relationship with the Android operating system today. It is launching a beta program running on Google Play for Android users. The intent is to figure out how to build a better app and keep people engaged. In one of the social networking company’s monthly “whiteboarding” sessions, Facebook Engineering Director Mike Shaver and its Android Product Manager Ragavan Srinivasan provided members of the media with an update on the company’s Android app and where it’s going. Shaver said that Android offers Facebook openness to produce unique features. He cited cover feed and chat heads, which the company released during the launch of Home. Android also offers Facebook extensive reach. In just Q1 2013, over 162 million devices were shipped and made up 75 percent of all shipments. Diversity on Android is especially interesting for the company because it gives the company the ability to see its app being used on a variety of mobile devices, compared to iOS where it’s a particularly uniform experience. But while openness, reach, and diversity are incentives for Facebook, it also acts as a double-edged sword and presents additional challenges. One of the downsides of having such a diverse and openness, the Shaver says that Facebook sacrifices a bit of control in terms of fluidness and in terms of who receives the latest updates. One of the things that Facebook tried to make sure that it was building the right product was to implement a beta program. However, that was quashed soon after launch. However, at Google I/O this year, it was announced that the Google Play Store would have an ability for developers to do testing. 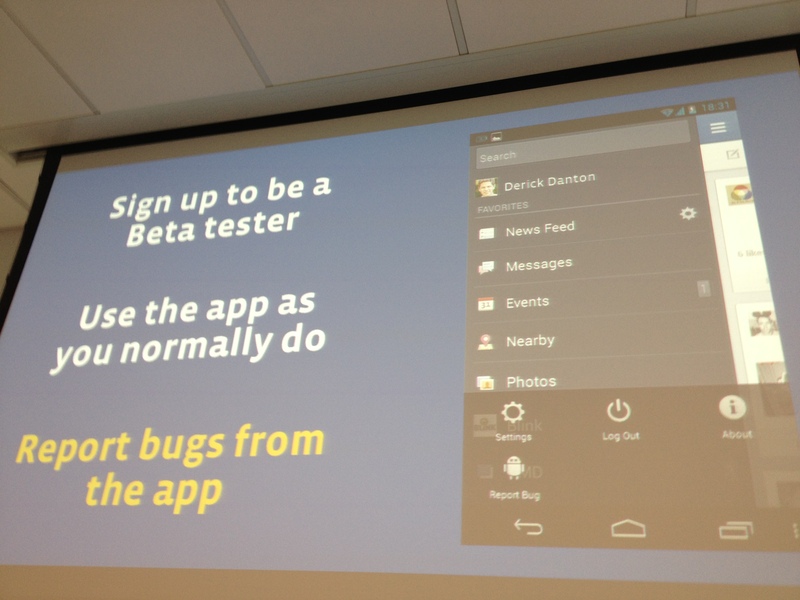 This leads up to Facebook’s news today: the introduction of a beta program for Facebook on Android. Facebook wants to make sure that they capture the right diversity of Android users on its platform. The company wants to reach out to those users that have the latest Android phone and also to those that have hundreds of apps on their device. From there, it will take real-world feedback from its user snapshot to improve its offering. The first type of feedback involves core bugs that Facebook wouldn’t be able to detect out in the field before the app’s release. The next type involves understanding how to improve the experience around Facebook for Android. The focus is going to be around the core metrics. Our goals with this program are to expand our pool of testers and gain feedback across a more diverse set of devices. Just by using the app and reporting issues, beta testers will be able to help us improve performance on a wide variety of Android devices we may have otherwise been unable to test at scale. How it will work is that users can sign up to be beta testers. Users will need to sign up for a Google Group and then specifically opt in to become a beta tester — both steps are required by Google. Afterwards, they can download the beta app from Google Play (however this is not required). The company has also established a Facebook Group to house active discussions and offer testers a venue where they can voice their opinions and provide feedback. This initiative is different from the partner beta program in that it’s focused on the core audience — the users, and not the OEMs or Facebook’s industry partners. The first beta is available starting today. Facebook is focusing on the main app right now and could expand it to its other mobile apps soon. Is there an Android problem? Earlier this week, the Facebook Android team posted a photo to its profile saying that they’re listening to the issues and complaints that users are apparently having with the app. Facebook didn’t specifically address the issues in its post, just that it isn’t ignoring what people are saying. Could it have anything to do with the performance of its Home Android layer? It’s due for an update in the next week or so (release every four weeks) and at last count, it had been downloaded from the Google Play Store just over a million times. We’ve theorized what Facebook could be doing with Home to make it better and if the company wants to parade itself around saying that it’s “mobile best“, then it will need to keep Android users happy. The launch of a beta program could help users feel more comfortable with the Android app. After all, having a specific group of users testing apps designed for their usage could be a good thing in helping Facebook develop something that could be better in tune with their lives — if not only to make sure that the company’s vision comes through.